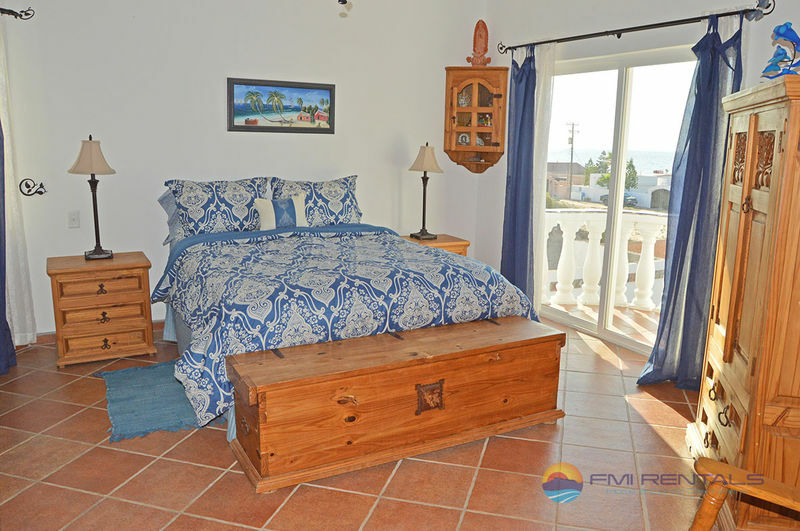 There are 2 master bedroom suites upstairs, one with a king size bed and one with a queen. 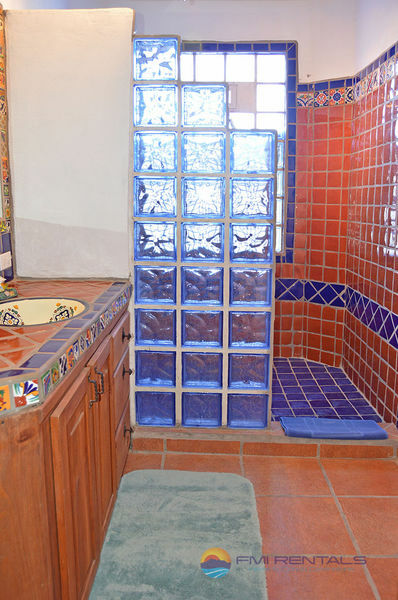 Each has full private bath with colorful Mexican tilework. 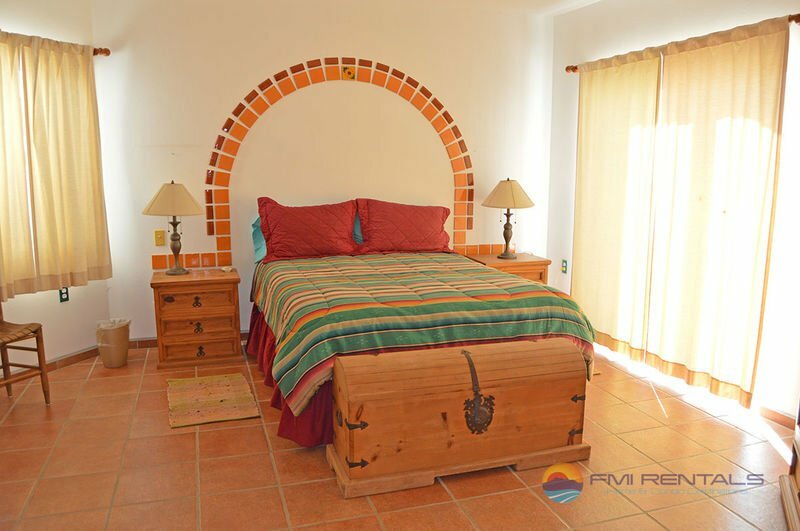 Downstairs is a self-contained casita with a queen bed and private bathroom suite, plus a second living space and smaller kitchen. 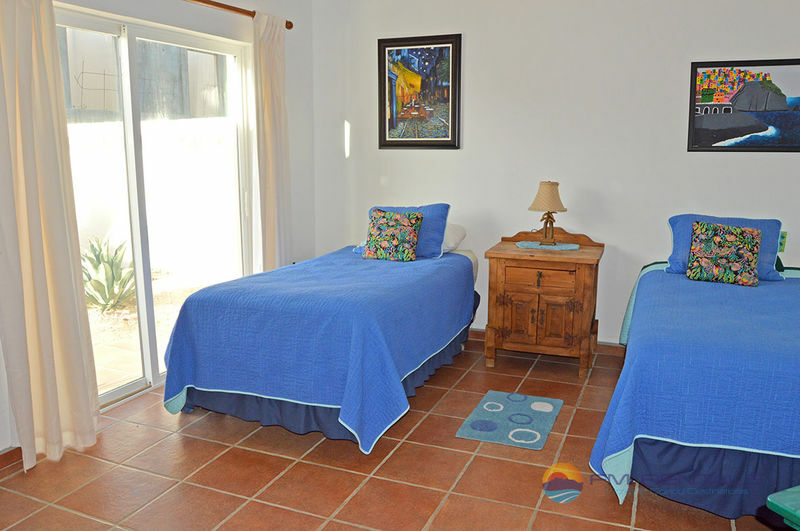 A fourth bedroom, downstairs, has a queen size bed, while the fifth bedroom, also downstairs, has two twin beds, making it perfect for kids. 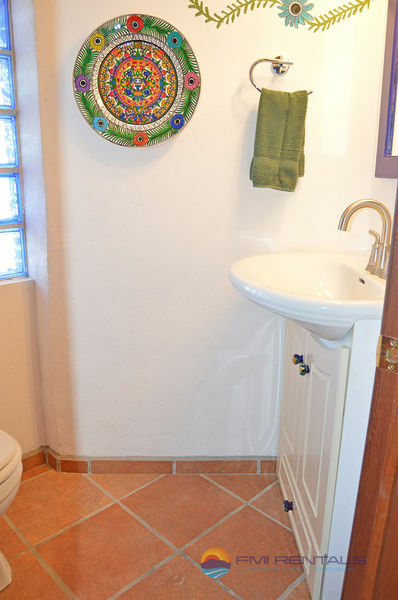 These two bedrooms share a full bathroom split into 2 rooms – toilet and sink in one room, and separate sink and shower in another room. 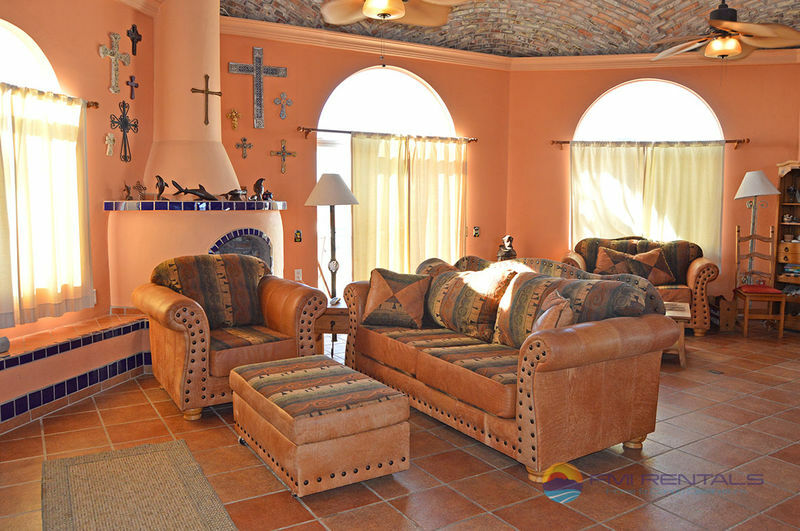 The brick-domed great room upstairs with gorgeous furnishings and comfortable seating is considered the heart of the home. 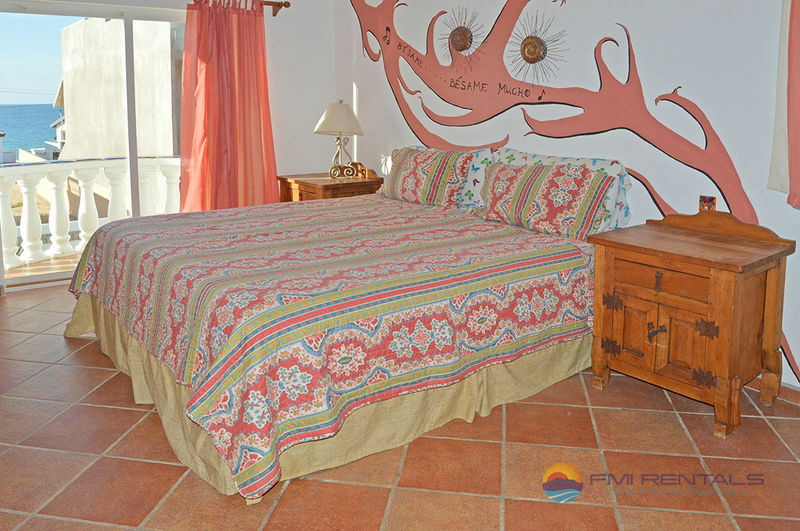 You will find Wifi, and a television with cable programming where you can relax after a day exploring Rocky Point’s many activities. 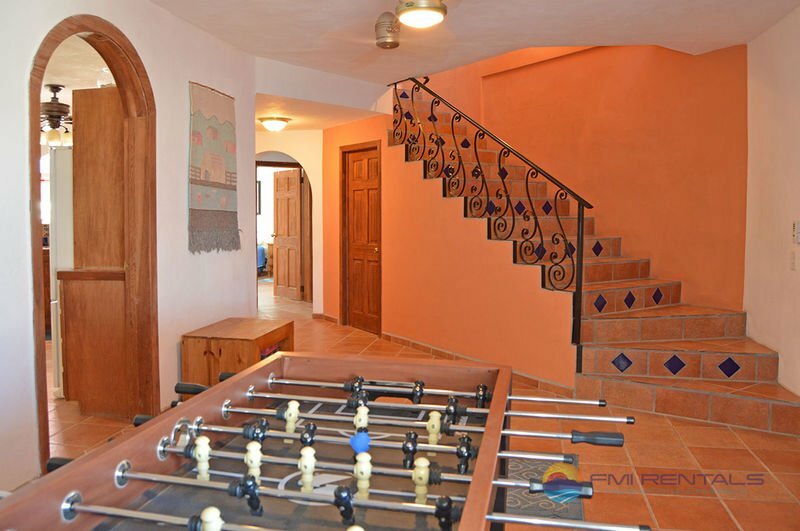 Downstairs is a foosball table, along with other games, puzzles and books to enjoy. TVs in most bedrooms can be used to watch movies or play video games. 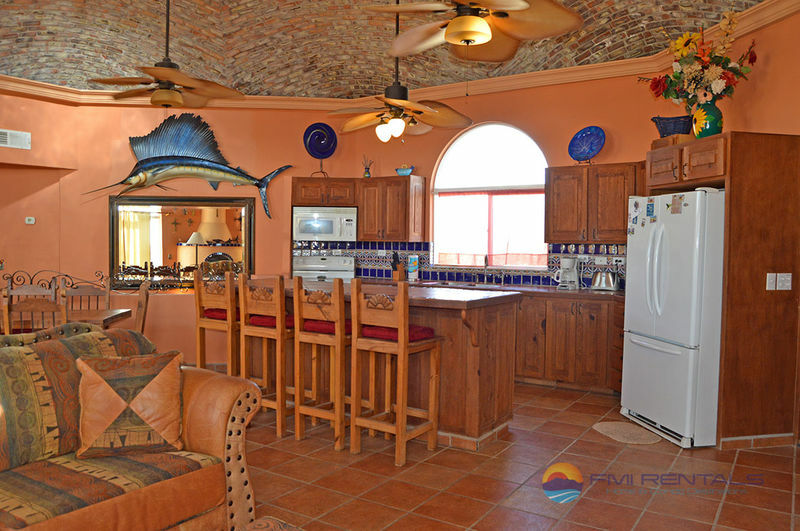 The full upstairs colorful kitchen offers a great eat-at bar and all the appliances and equipment needed to create and savor delicious meals. There’s also a dining area where you can gather the group for meal time. The breakfast bar seats four, while the dining table seats eight. 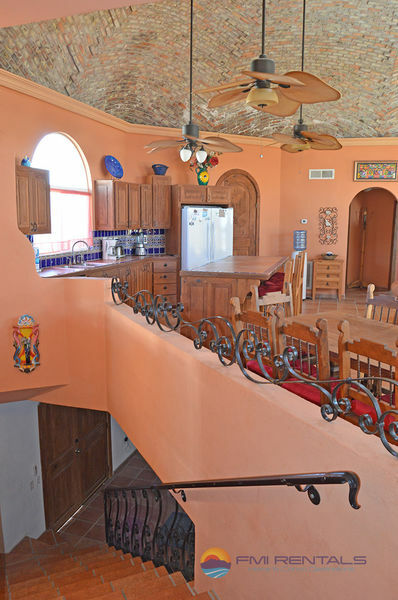 There are two wrap-around balconies — one on each floor. 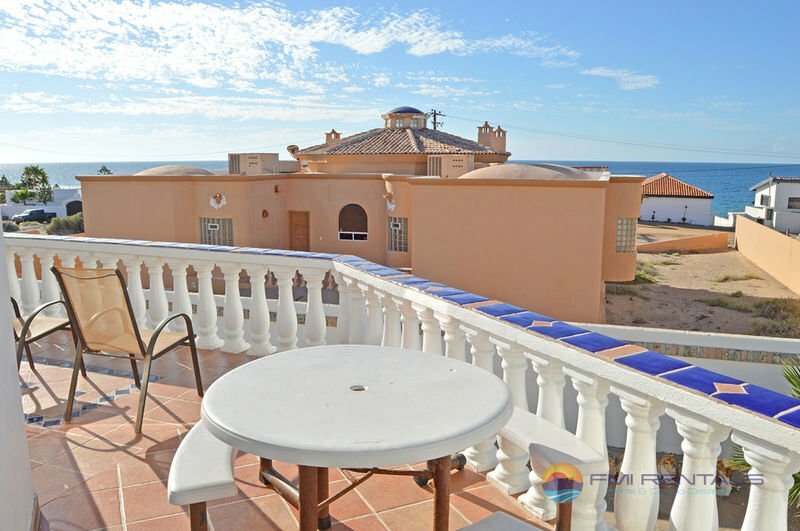 Upstairs on the balcony is a table and a BBQ for outside dining and eating. 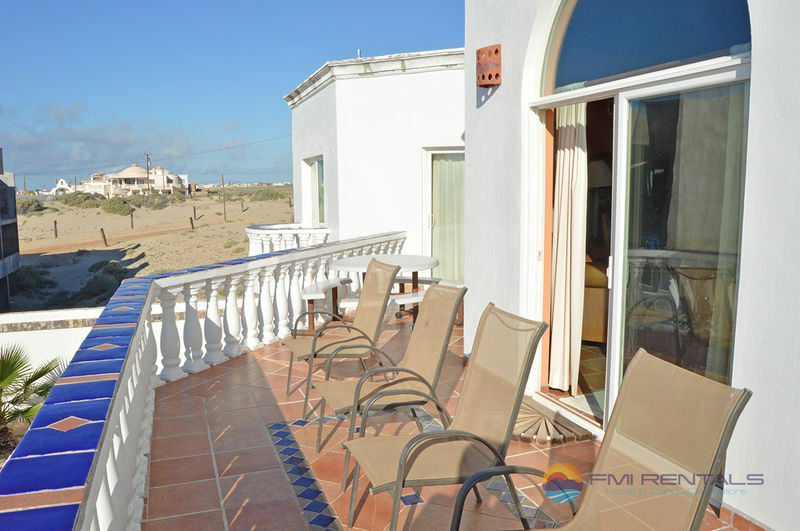 Be prepared to sit back and take in the amazing views of the sandy beaches and clear blue water whenever you visit Azul Mariposa. 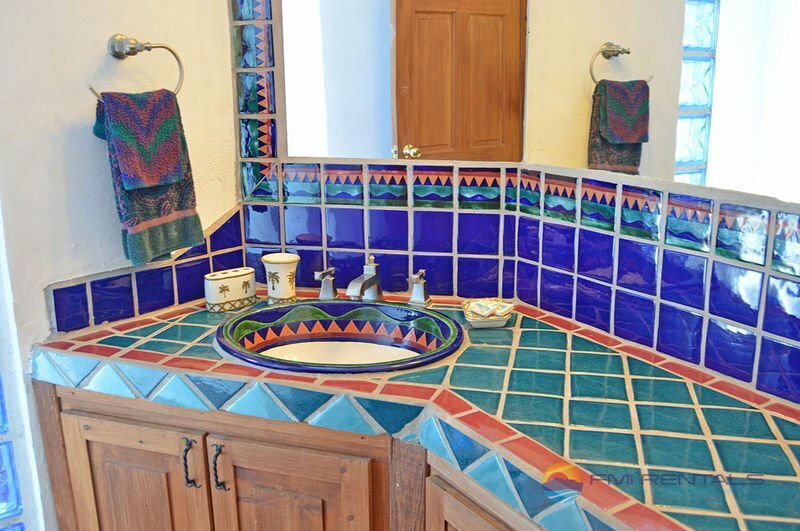 Azul Mariposa is a great alternative to staying in a hotel. 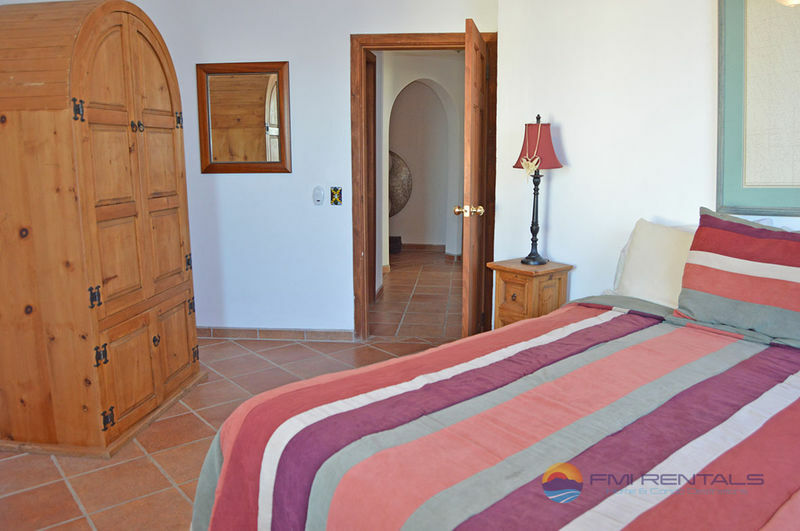 With the separate bedrooms and full kitchen, along with all the space, your group won’t be crammed into a couple of hotel rooms. 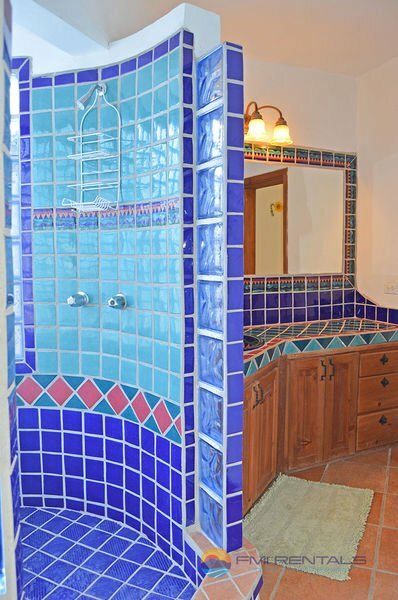 You will be able to spread out and enjoy the home and all of its wonderful amenities. 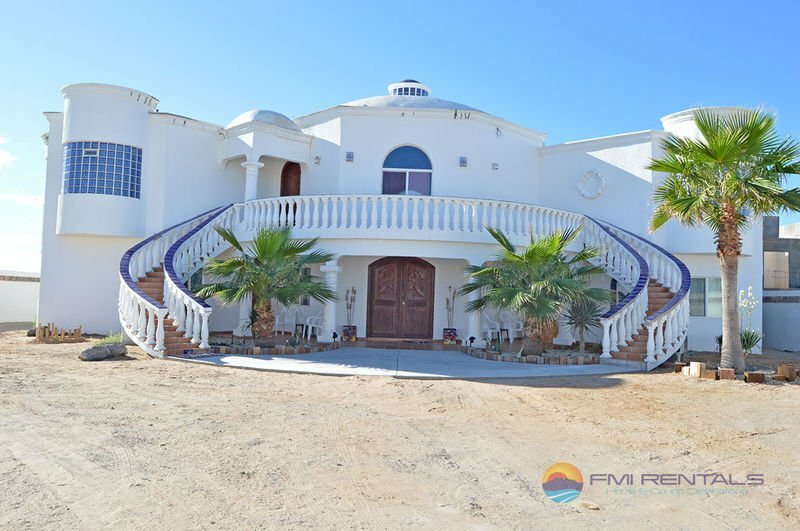 You may even find that this home is more budget friendly than a hotel, giving you more dollars to enjoy the area’s many activities and attractions. 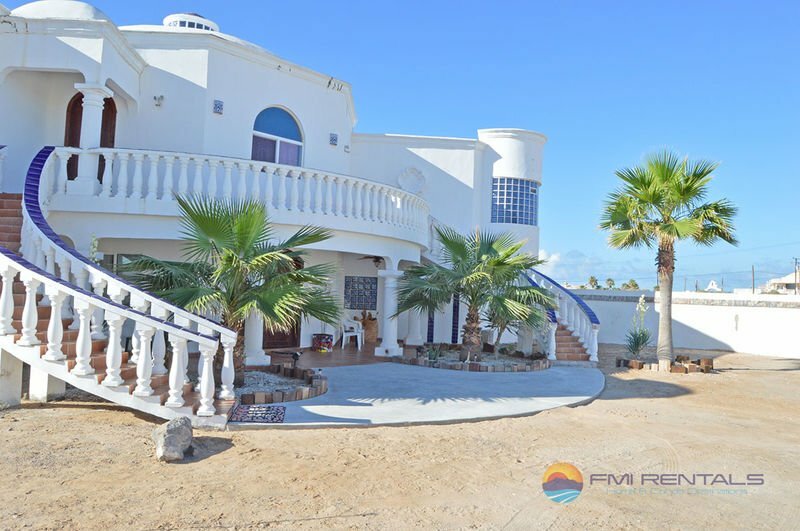 Go out and enjoy some great local flavors at the many restaurants and eateries from this centrally located choice of vacation homes in Rocky Point. 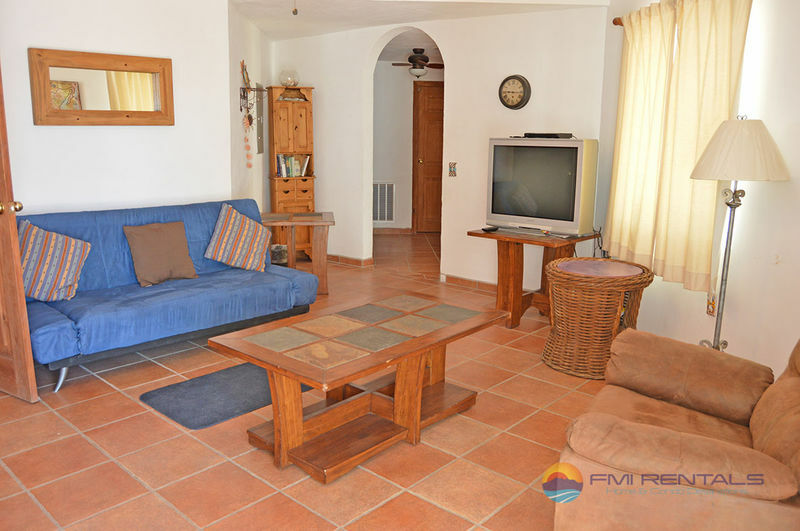 You can enjoy a day or two on one of the golf courses, or how about a day of fishing either on a boat or off the shores of the gorgeous beaches. 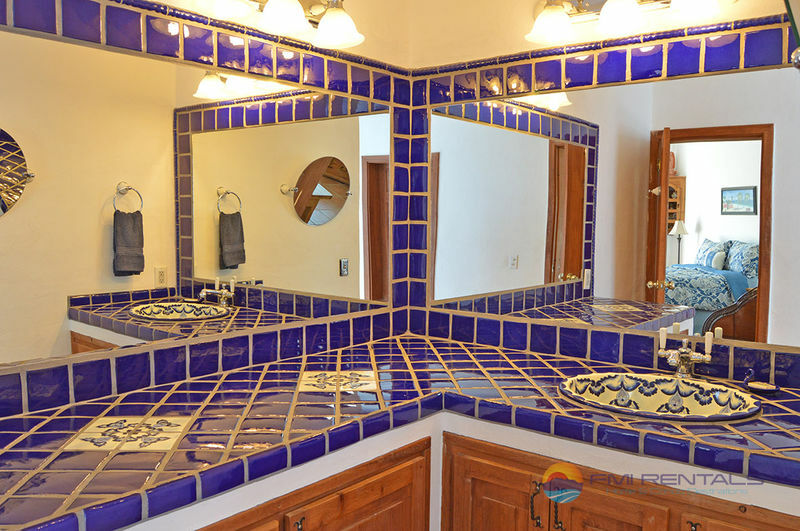 Call today to reserve this wonderful choice of Rocky Point vacation rentals.